Preheat oven to 450 degrees. Line a large cookie sheet with aluminum foil. Lay pieces of Matzo in one layer on the pan. Break it into pieces to fit as needed. Melt butter with brown sugar over medium heat. Stir frequently until it bubbles. Pour over matzo and spread to cover. Put in the oven for a minute or two. 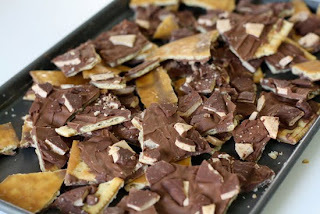 Remove from oven and with a spatula spread chocolate. Sprinkle with nuts if desired. Freeze 20 minutes until hard. Crack into pieces and store in a zipper bag in the freezer.